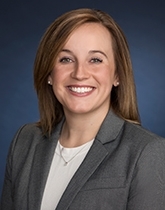 Erin N. Gibbons is an Associate Attorney, focusing on real estate and corporate transactions. She represents buyers, sellers and lending institutions in both commercial and residential real estate transactions. She also represents landlords and tenants in commercial and residential leases, and counsels businesses on various corporate matters including corporate formation. Erin prides herself on being a strong advocate for her clients to ensure their individual needs are met and their transaction goes smoothly. Erin graduated with a Bachelor of Arts in English from Fairfield University, where she played for the women's soccer team. She continued on to receive her Juris Doctor from Suffolk University School of Law. Admitted to practice in Massachusetts, Erin is a member of both the Massachusetts Bar Association and the American Bar Association. As a resident of Wayland, Attorney Gibbons also serves on the School Council at her daughters' elementary school and can frequently be found at or on a soccer field in the MetroWest area in her spare time.